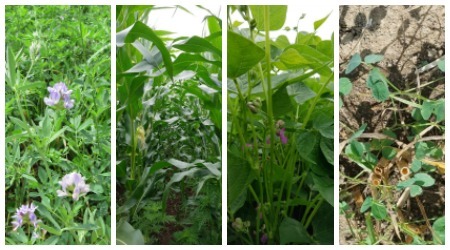 These crops are pictured above left to right. The far right picture shows the alfalfa and grasses after the oats & pease have been harvested. Not all fields are at the same point in the crop rotation. Typically fields of about 50 acres are at different stages within the rotation. In the spring, the oats and peas are planted at the same time. They begin to grow and germinate, starting to make a root. About 2-3 days later (weather dependent), and before the oats and peas have emerged, then we go into the field with a tine weeder and pneumatic air seeder, both behind the tractor at the same time. The tine weeder shakes up the soil and takes out any little weeds that are growing, and the pneumatic air seeder adds grass and alfalfa seed. The oats and peas remain undisturbed during this because they are planted about 1 1/2" deep and the tine weeder removes weeds only to a depth of about 1". Deeper weeds still can come up, but this process removes many of the weeds. Ideally it is a sunny day, and the weeds that were disturbed are completely dried out and dead. About 2-3 hours after the tine weeder / seeding - the field is rolled to pack the soil. This gives all of the different seeds good contact with the soil to germinate. In the summer – approximately early August - the oats and peas are harvested. Combine Directly – If the plants are high enough, the combine goes in and harvests the crop directly. However, this can be hard on the combine especially if there are weeds in the field (which will be green versus ready for harvest) and can make it harder on the combine to process the oats and peas, get caught in the combine and plug it, etc. Another factor is that pieces of the green weeds get mixed in with the oats and peas which adds moisture to what is collected, and can cause the harvested crop to heat up and spoil in storage. 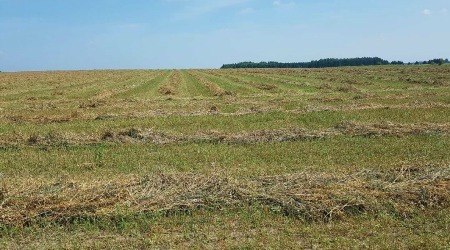 Swath First, then Combine – Another option is to swath the oats and peas, which involves cutting them close to the ground and allowing the cut plants to lay in the field and dry before going through the combine. This is easier on the combine, but is more weather dependent. This year, after the crop was swathed, then it rained - delaying combining. This can impact the quality of the seed harvested and/or require mechanical drying after harvest. In the picture above you can see the oats/peas mixture after it has been swathed. The oats and peas as they grow provide an opportunity for the alfalfa and grass seed to become established and grow underneath. 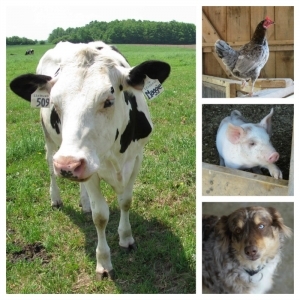 Oats and peas used as feed, is an excellent source of protein. Oats have about 8-9% protein, and peas about 30%. Combined, it provides about 14-15% when mixed and fed to the cows. Regardless of harvest method, the straw from the oats and peas is also collected – usually baled, and used later as bedding for the cows. 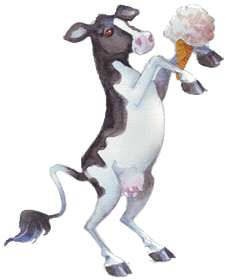 Although not common, or in large quantities, it may also be fed to the cows. 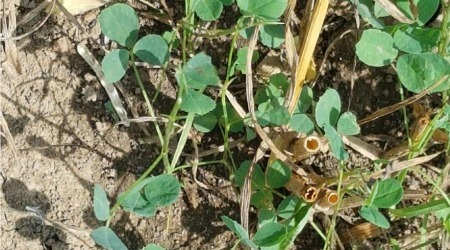 Despite being trampled on during harvest, the alfalfa and grasses that were growing under the oats and peas survive the process well and continue to grow – as shown in the picture below. By the fall the alfalfa will be 4-6" tall and ready to survive the cold of the winter. 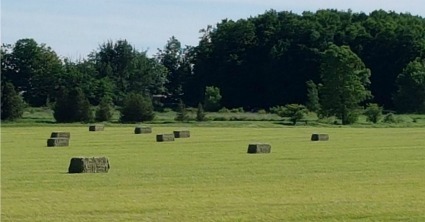 In the spring the field is now ready to be harvested for hay, or used for pasture.